Spigot’s Stores or Inventory Module is suitable for stores that operate on a hub-and-spoke model (where it is integrated along with any of Spigot Software’s HMS solutions) as well as for stand-alone stores. This means, items can be ordered separately, independent of the HMS. The Stores module manages an exhaustive inventory process for all consumables other than drugs within a hospital or in any other store. SPIGOT Inventory Management software comes in different variants. 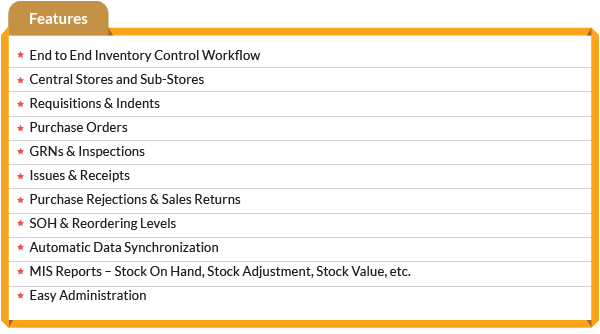 The Inventory Software is suitable for individual retail shops selling general commodities/items, in a central/sub store model, distributor model & stores within a bigger organization including hospitals. This software is highly scalable & works across all the activities in the store. The software works both in the individual database mode as well as centralized database mode.